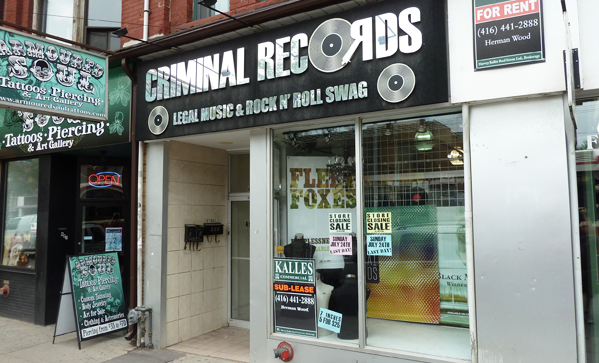 Yesterday saw the end of one of Toronto’s favourite record stores, as Criminal Records closed its doors for the last time. Opened in 2006, the eclectic and atmospheric store offered low prices, a great selection of vinyl and CDs, and plenty of rock and roll swag. My first trips to Criminal Records were spent coveting a Lou Reed t-shirt in the front window; it only later occurred to me that Criminal Records sold, well…records. Given the mega-city’s size, the importance of independent record stores to Toronto’s character is undeniable. Many fans have (re)discovered the magic of the vinyl record, and as the HMV’s and Sunrise Records of the world seem intent on selling everything BUT music, the indie store is becoming the only place for guys like us to get a fix. To that end, here are some of Toronto’s best and most diverse independent record stores. P.S – Don’t see your favourite here? Get on the comments board and let our readers know where they SHOULD be going! There are plenty of musical genres that most so-called hip record stores stock too little of, if they stock it at all: world music, classical, opera, and the blues are sadly under-represented on the modern audioscape, and deserve a record store of their own. Amoroso is that store. Tucked across the street from the also excellent Rex Jazz & Blues Bar, Amoroso carries a great selection of vinyl in genres that are barely acknowledged elsewhere in the city. If your idea of a great evening involves throwing on something from Placido Domingo, Beethoven and Ladysmith Black Mambazo, there’s a good bet you’ll find it here. 4 St. Patrick St. The clientele at Kops Records might still lean slightly hipster (we’re still on Queen West after all), but the music is different enough to help you to deal with it. Kops’ stock-in-trade is hip-hop, soul, funk and roots music, with only a little rock and roll, thrown in for good measure. If vintage Otis Redding, James Brown or Miles Davis is your thing, then you need to Kops some attitude! 229 Queen St. W.
Up Yonge, just north of Dundas, laughing the face of HMV, Play De Record is definitely a DJ’s hangout, where rare remixes share shelf space with the latest audio technology and hardware. Their stable of electronic music releases is arguably the city’s best. It’s not for the inexperienced — there’s a lot here, and being informed before you enter might be a good idea — but it’s definitely a place any self-described audiophile should check out. 357 Yonge St.
A monument to vinyl fetishism (no, not that kind; try Aren’t We Naughty instead), Rotate This! is like the best, and worst, record stores, in that the staff is knowledgeable, but with a default silent-treatment tendency. Not that that’s a problem, since Rotate offers an amazing selection of indie rock, heavy metal, jazz, funk and hip-hop, and it’s not like you came here to chat. Mining the used LP section always yields excellent results on the cheap. As well, Rotate offers plenty of limited edition collections and rarities, sure to get the vinyl monkey on your back going. They also sell tickets to events, just in case you feel like leaving the house sometime. 801 Queen St. W.
Jumping from one end of the city to the other, this Roncesvalles shop is a great place to hit up for used LPs and books (there’s a second — original, actually — location on College, but we prefer the atmosphere at Roncey). Offering a fairly eclectic selection, She Said Boom stocks plenty for everybody. For example, on one record-buying bonanza, I walked out of here with a nearly new copy of Parliament’s Mothership Connection and an equally excellent copy of Bob Dylan’s Blood on the Tracks. I passed on The Wailers’ Natty Dread, realized my mistake, and went back — too late. Don’t let the same tragedy befall you. 393 Roncesvalles Ave. and 372 College St. This Annex institution (and the closest thing the city has to San Fran’s warehouse-size used-music staples), Sonic Boom is prepping for a big step up to Honest Ed’s, and opening up a second location in Kensington Market. A good move for a store with a simply massive stock of LPs. Sonic Boom caters primarily to the indie and hipster crowds, but there’s so much selection here that everyone is bound to find something that tickles their fancy. Sonic Boom also hosts plenty of live events, so you can see your newly purchased vinyl performed live by the artists themselves. (Also deserving of significant in-store-performance love: Soundscapes, which possibly boasts the city’s best-informed new-release music website.) 512 Bloor St. W.
Image courtesy of Chris Wright.